Great cover letters embody timeline principles. And Leonardo da Vinci’s cover letter really drives home that point. Leonardo da Vinci was interesting in getting a job with Ludovico il Moro, Duke of Milan. Evidently besides his skills involving painting; he was also an armorer and a military gadgets inventor. So wanting work, he did what all job applicants do; he sent a cover letter – a long cover letter. By the way, you can read a translation of this cover letter by clicking here. And to understand my next few points, you do need to read it – so click here, head over, read and come back. What did you think of the cover letter? Why are you writing me? What can you do for me that others cannot? Now, go back and see if Leonardo da Vinci answers those questions. Yes, it’s lengthy, but it works. It works because he does this one thing that makes it brilliant. He makes it all about what he can do for the Duke – and in the process answers all 3 questions like the genius that he was. I am writing to apply for the job of rock basher that you advertised in the Sunday paper. I feel I am uniquely qualified for this position. I believe I can bring my experience and talents to your company and be a truly great rock basher. I have enclosed resume for your consideration. I made this letter on the fly but – man – I have actually read letters like this. This letter is all about Bam Bam and what he had done in the past. Leonardo da Vinci’s cover letter is all about what he can do for the Duke in the future. Cover Letters are about what the hiring manager wants and what you can do for the hiring manager. Resumes are a collection of past accomplishment from which the reader may or may not infer future performance. 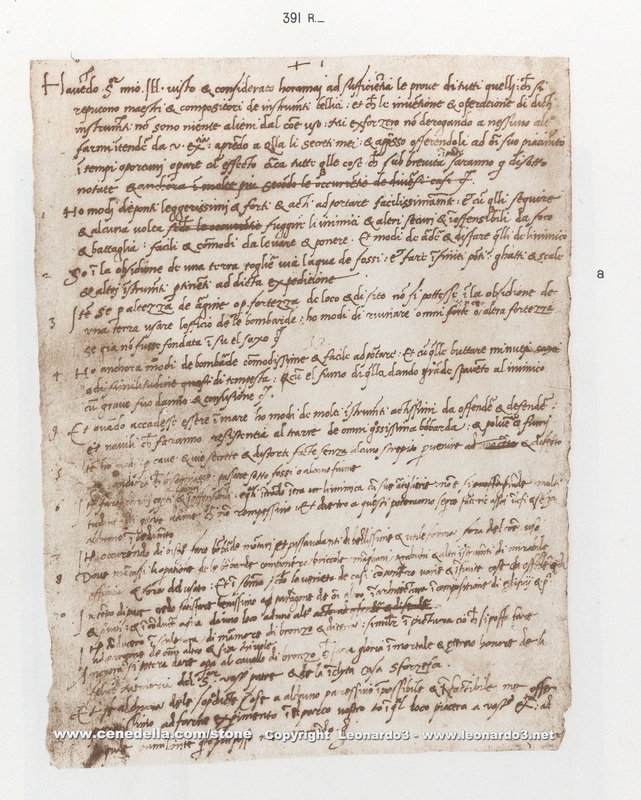 Leonardo da Vinci’s letter may be long but it is a cover letter because of what it does. And the length is okay because he sent it directly to the hiring manager – the Duke – and not to his HR. A lengthy cover letter to HR would probably not be a good idea. It’s on point. At the very end, this man who has the talents to paint the Mona Lisa casually mentions that he can also paint or sculpt for the Duke, if the Duke wanted that. Leonardo da Vinci begins with his strongest selling points and tapers it down. Always take your best shot early. It’s all about the Duke. Every line and thought is about what he can do for the Duke. How intrigued must the Duke have felt as he read this. Imagine a hiring manager reading your cover letter that explicitly is all about her. He’s ready to back up everything. Talk is cheap. Resumes can be a great work of fiction. A strong cover letter that states what you can do for the hiring manager and then asks for opportunity to back it up is absolutely the way to go. Beginning and an End. He has a short intro explaining why he’s writing. He has a finishes by asking to meet to demonstrate what he can do. This letter covers all the bases. So, as you write or contemplate writing your cover letter; thoroughly examine Leonardo da Vinci’s cover letter and consider how it might help you. Of course, if it all feels overwhelming, you don’t have to do this alone. Write a letter and have a mentor or friend critique. You can use the services of Phil Baker’s One Click Cover Letter software. Or you can head over to online Microsoft Office and pull up dozens of cover letter templates. And you can search for examples on the internet. You also have a couple of different examples on here at Landing On Your Feet, too. However why you go, just remember the focus must always be on the hiring manager.